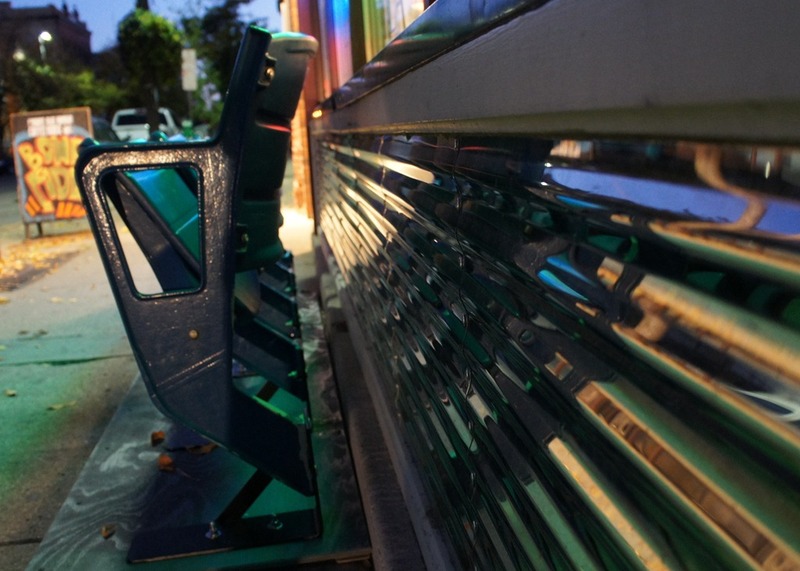 I missed it yesterday but Curtis Tiano took this photo of the first four people to park their rear ends on the new outdoor seating at the Goodbye Blue Monday. 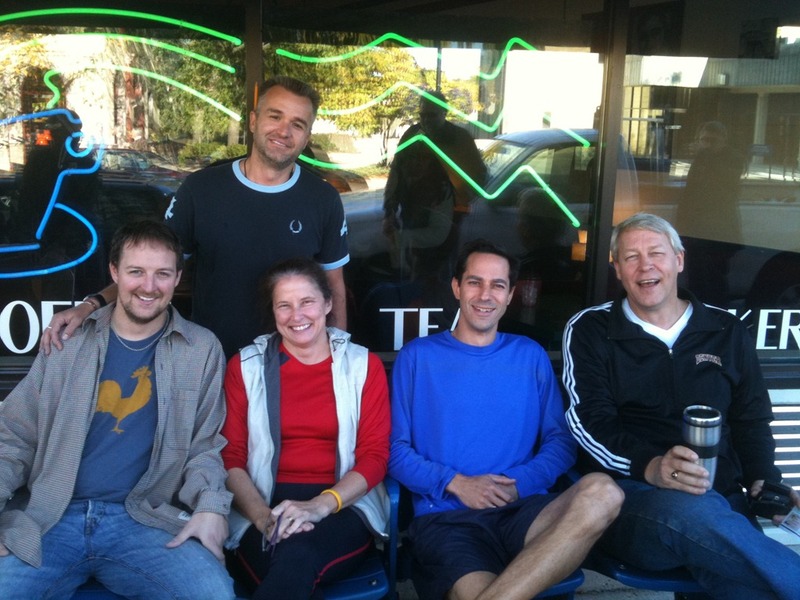 L to R front: Alex Beeby, Jane Moline, Justin Stets, Rick Estenson. They were supervised by GBM co-owner Dan Riggins. 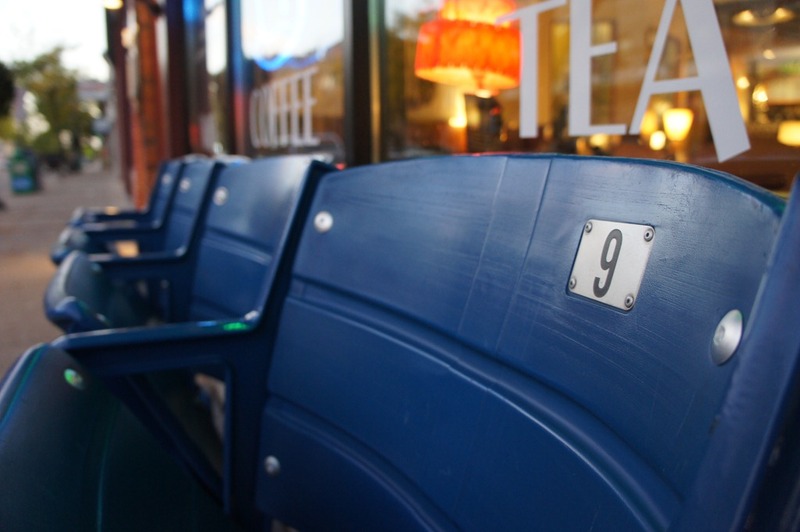 There is a Philadelphia connection to these seats but I don’t know what it is. 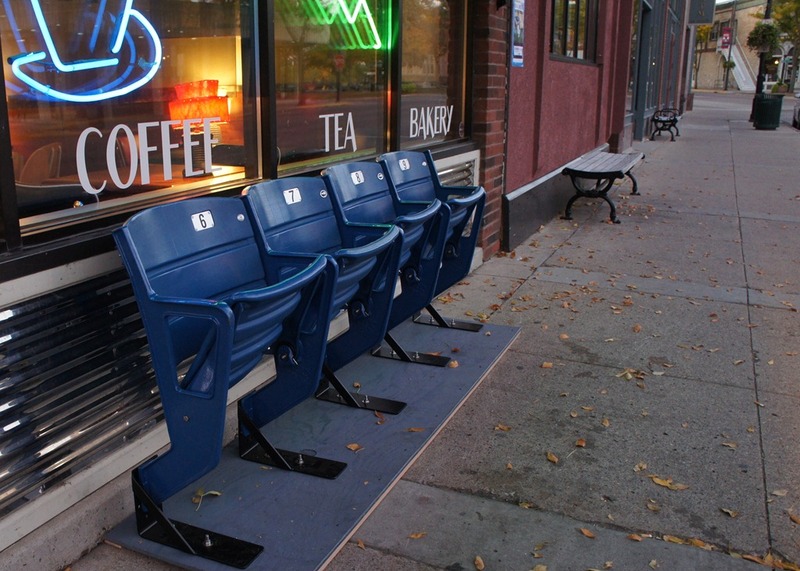 Vet stadium seats? A little old blizzard did not deter the organizers or participants (some on cross country skis) for yesterday’s Jingle Bell Run/Walk. Justin Stets was the MC and Northfield HCI czar Zach Pruitt was beauty on duty, as this year’s charitable recipient was the Northfield Healthy Community Initiative Mini-Grants Program. I took this photo of Regi last Saturday while he was having coffee at the GBM with Greg Carlson, Justin Stets, and Rick Estenson. See all our blog entries tagged with "Reginaldo Haslett-Marroquin." 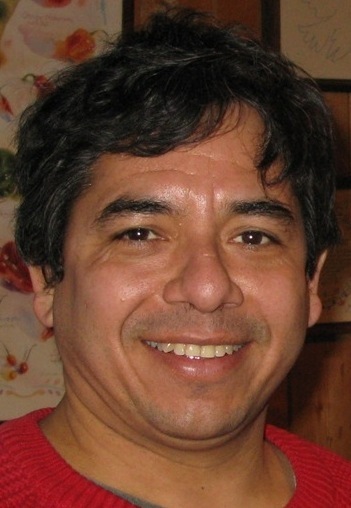 Obituary notices had been on my mind already (no link necessary) so his column got me thinking about the local public conversations that happen or don’t happen when someone dies… and whether the local online world could be helpful. 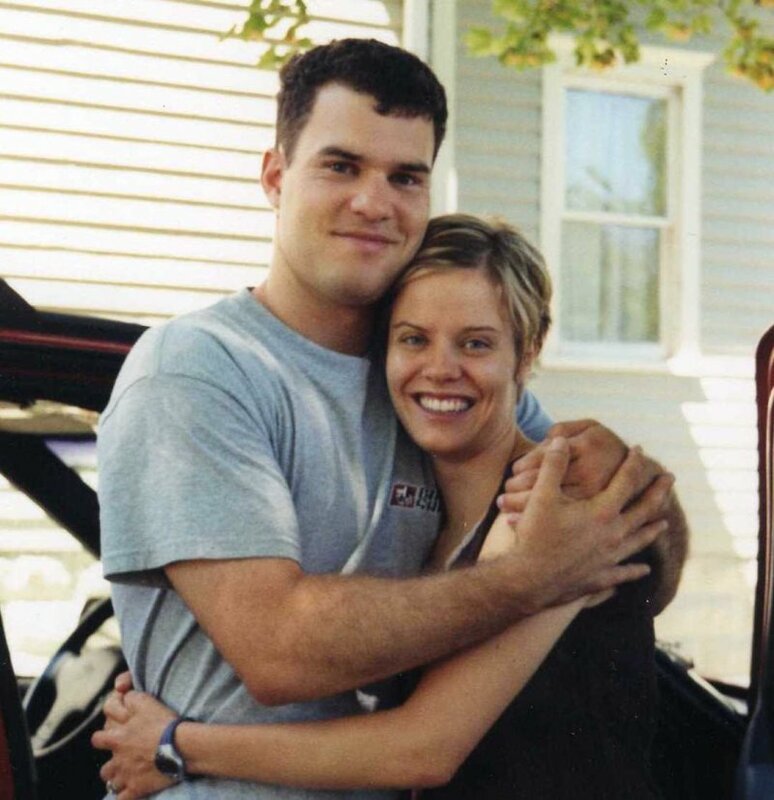 Northfield teachers Brenda and Andrew Gilbertson contributed to a public Caringbridge site for a couple of years until Brenda died last spring. I didn’t know either of them but I do remember hoping Andrew would continue writing publicly after Brenda died. I thought the visible community conversation after her death could be as important for healing as that which occurred online while she was sick. 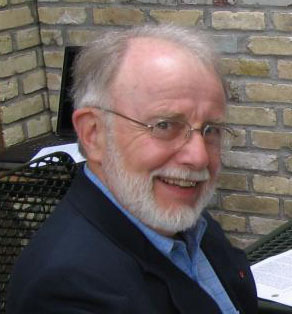 Don Tarr died suddenly in June last year, a week after we’d interviewed him for our podcast. In retrospect, I wish I’d started a public conversation online about him and his contributions to the community. 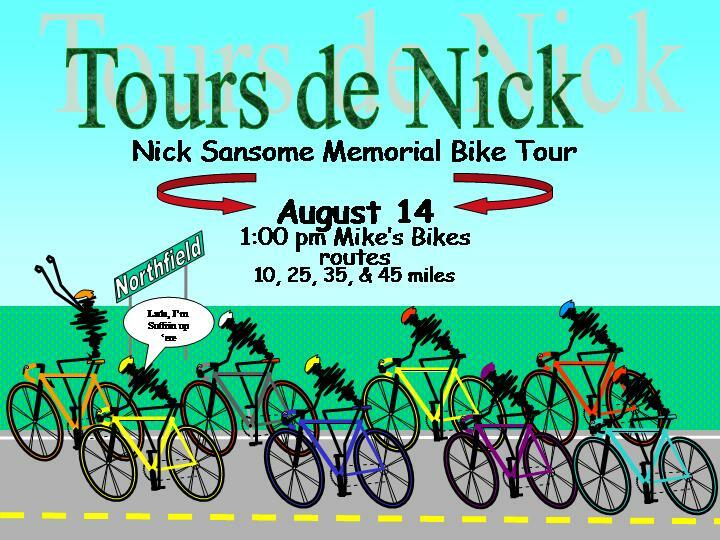 Each August, the Northfield Bicycle Club hosts Tours de Nick, the annual bicycle tour in memory of young Nick Sansome who took his life five years ago. Each year, I find myself wanting to click my way to a website about Nick, as my memory of him is fading. Justin’s sister didn’t live here so this is a bit different than the examples above. But Justin does live here and he’s gone public with his reflections so maybe it’s as good a place as any to start talking about death in community and what role, if any, the local online world/blogosphere could play beyond posting the same obituaries that appear in the paper. I asked Justin for permission to post his column and he emailed me the text of it. I couldn’t find a link to it on the News’ website. Also, I didn’t ask for his commitment to participate in a conversation thread here, as I didn’t want to be presumptuous. This might be a good idea or a lousy idea and he shouldn’t be the one to make something happen. That’s up to the rest of us. A little over a year ago, my sister took her life. This loss of one I loved deeply intensified my existing fear of death. It also required me to face my anxieties straight on, and that is what I have been doing for the past year. The fear of death grips me fiercely. I have always struggled with the concept of my mortality. For a person of my age, I have spun and analyzed death too many times over. Almost half way through life and I have yet to come to terms with the fact that one day biology stops working, cells stop reproducing and the heart stops beating. From an emotional standpoint, I don’t much wish to leave my children. Spiritually, I feel like when I am 70 or so, that that is the time I will begin to understand what life is all about. Life, for me, is really worth living and the more I live, the more I want to live, and learn and love and change the world.